About two months ago, I set up a plan to earn Hilton HHonor points. Before then I was not interested because of the low valuation of Hilton Honor points. For example, starting March 28, 2013, it would require 40,000, not 30,000, Hilton HHonor points to redeem one night at Hilton Los Angles - San Gabriel, which costs about $140 per night stay. What led to my plan change? We have SPG points but preferably to reserve them for Sheraton Starwood Hotel stays or conversion to frequent flyer programs with 5000 bonus SPG points. My wife, Isa, only stays at Sheraton during business trips. That rules out Marriott option. Numerous credit cards offer Hilton points sign-up bonus with manageable minimum spending requirements and most importantly, some of them are churn-able. The new Citi Hilton Reserve card offers two weekend nights certificates. Incentives from Las Vegas Hilton Grand Vacation stay will add 15K HH points and $200 Hilton credits to my Hilton HHonor account. My Hilton account has about 50K HH points. These points alone would be enough only for two Hilton hotel nights. Seven free Hilton hotel nights would be nice. 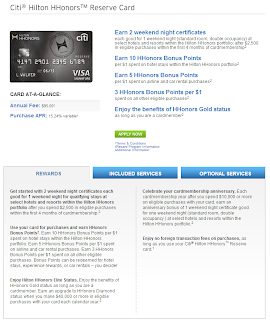 American Express Hilton HHonor Card - No fee, spend $750/3 months, 40,000 Hilton Honor points. 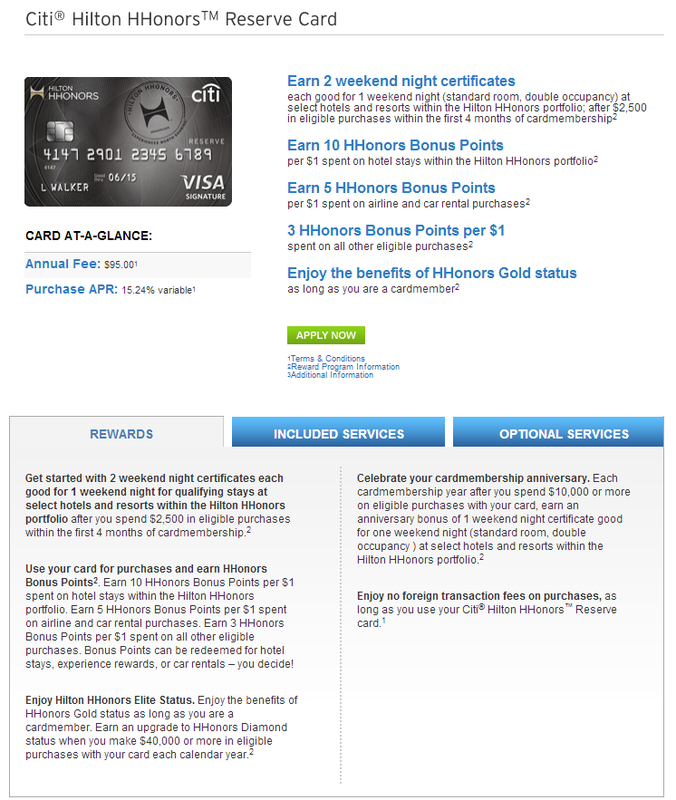 Citi Hilton HHonor Visa Signature Card - No fee, spend $1000/4 months, 40,000 Hilton Honor points. There seems to be a No fee, spend $1500/4 months, 50,000 Hilton Honor points offer floating around, but the web page does not indicate that. I have not tried it personally. Citi Hilton HHonor Reserve Card - $95 fee, spend $2500/4 months, Two weekend (Fri,Sat, Sun) nights certificate for participating Hilton Hotels. 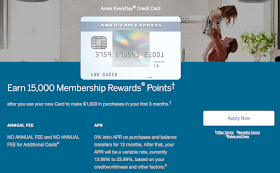 American Express Hilton HHonor Surpass Card - $75 fee, spend $3000/3 months, 60,000 HH points, but the first 40,000 HH points can be earned after the first transaction. 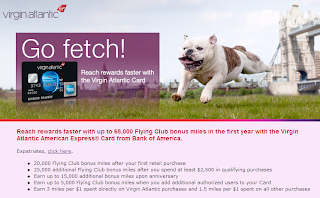 American Express Virgin Atlantic Card (Thanks to Milesabound.com) - $95 fee, spend $2500/3 months, 50,000 Virgin Atlantic points is an easy gain, which can be converted into 100,000 HH points. 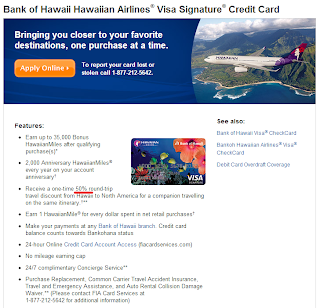 Bank of America Hawaii Airline card - $79 fee, spend $1000/4 months, 35000 Hawaii Airline miles to be converted into 70,000 Hilton HHonor points. Plus a one-time 50% discount on companion ticket during the first year. 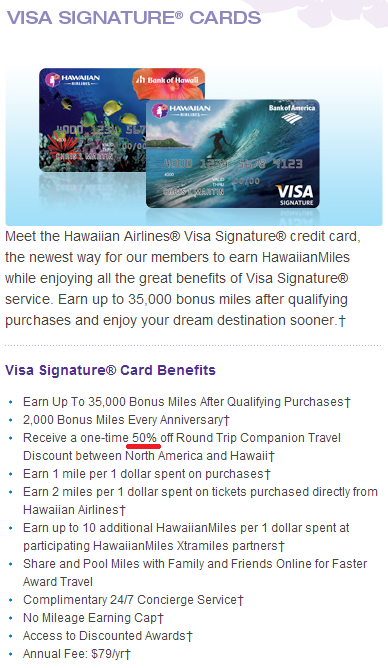 Bank of Hawaii Hawaii Airline Card - $79 fee, spend $1000/4 months, 35000 Hawaii Airline miles to be converted into 70,000 Hilton HHonor points. Plus a one-time 50% discount on companion ticket during the first year. As a current holder of Hilton credit cards, regardless issued by Citi or American Express, I am not eligible to apply for other Hilton credit cards. (I forgot about this point, therefore was rejected for Hilton Reserve Card last week.) If one does not feel comfortable to apply for all seven credit cards on the same day yet interested in most of them, they can be separated into two batches. Apply Batch I first, then Batch II 90 days later. Batch I consists of non-Hilton credit cards #5-7. Batch II consists of Hilton credit cards #1-4, with card #4 not a top priority if Batch No. 1 is approved. Note the time-frame and the total minimum spending requirements for all these credit cards; plan well. HHonors points will appear 4-6 weeks after meeting the minimum purchase requirements. It seems that the amount of Hilton HHonors points required to redeem a Hilton hotel night does not increase as the travel date is near, as long as room is still available. It required 30K HH pts to redeem Hilton Los Angeles San Gabriel one night stay two months ago. As of today, it requires also 30K HH pts to redeem for one night stay which is only 3 days away. I may need to wait as late as possible also to allow HHonors points to sink into my Hilton account, then redeem for Hilton hotel reservations. The credit cards will arrive next week. If our planning works out, my Hilton account will have 150,000 HH points four weeks later (45,000 + 15,000 + 90,000), which is good for two London Hilton nights. Isa will have two Hilton weekend nights certificate and 100,000 HH points two months later. We will pay for the remaining two nights, or use some SPG points then. Meeting the minimum spending requirements is the next mind-teasing challenge. 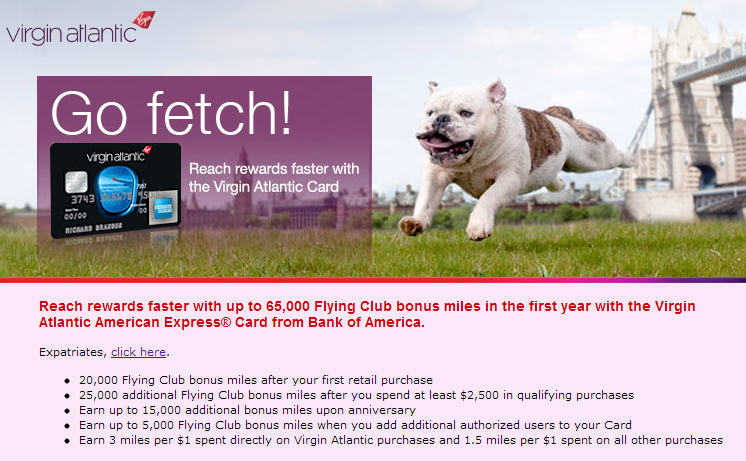 One week later, my AMEX Virgin-Atlantic card was also approved. Isa's Bank of Hawaii card was rejected (Alleluia! because it would be difficult to fulfill spending requirements of five cards). There are four new cards total. Isa's credit score has been improved from 700 to 753. My mission to improve her score is accomplished. 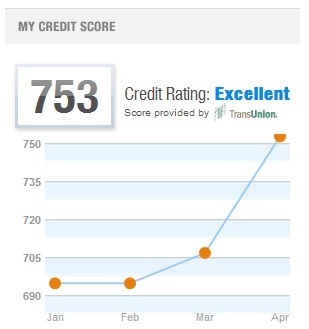 She officially joins the excellent credit score club. She had only two credit cards 18 months ago, and had not applied for more than five in her life. To credit card companies, this is not good. She hits 6 now. That is enough. In the Batch III, also apply one Chase card and one AMEX card. Transfer from Virgin Atlantic miles to Hilton HHonors points will be 2:3 instead of 1:2 starting February 6, 2014. It is a bad news, but in line with expectation, because airline and hotel programs will continue to devaluate their points and miles. 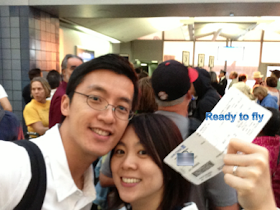 I love to ask Isa, "Where do you like to travel?" Follow our "Beautiful Life" emails to share our Joy!